Bridal hair accessories can easily be made using the same twisted wirework technique as for tiaras. In essence, using a suitable wire, just bend a short length in two, thread on your bead or beads and twist the wires together. Bend into shape and then attach to your frame such as the hair comb. The beauty of this tehcnique is that you can easily bend and adjust the wired beads to create a delicate and balanced design. We like to add a few Swarovski crystals to make the piece sparkle. Flowers are, of course, one of the most popular themes for bridal hair accessories and you can easily make some very attractive flower motifs. 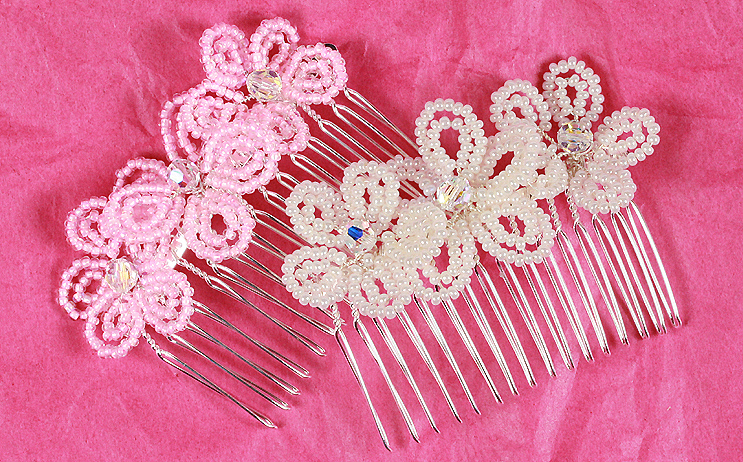 These cream and pink wirework hair combs look pretty and are easy to make with seed beads. We used a facetted crystal AB Swarovski bead as the flower centre. 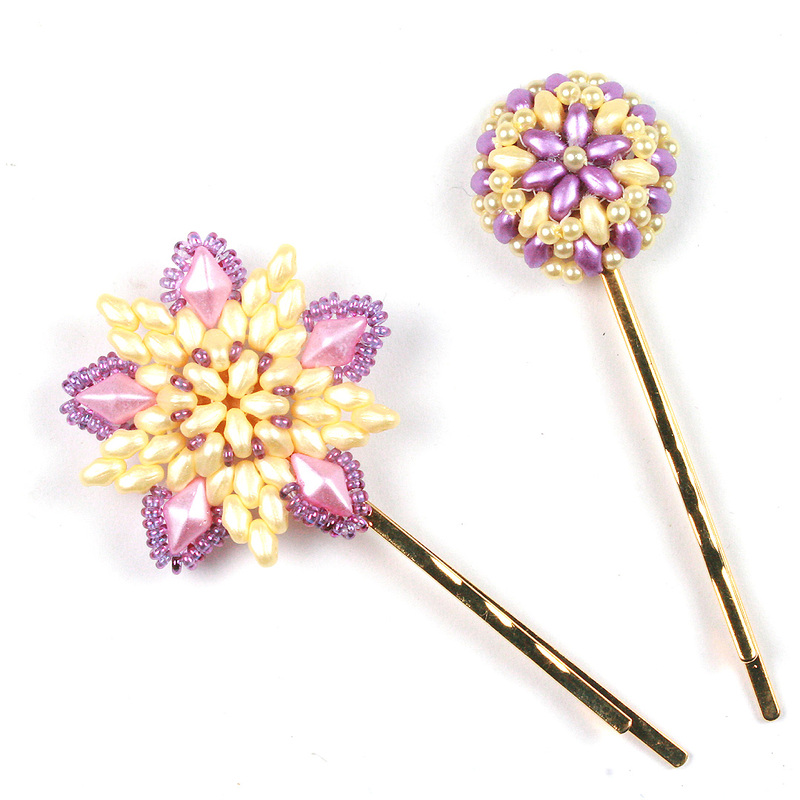 You can make lovely little flowers to embellish your haircombs using Preciosa pip beads. We added seed bead leaves and embellished them with a few gleaming Swarovski crystal pearls. These wirework hair pins have 5 loops and are easy to make a freeform design used twisted wirework. For classic elegance we used Swarovski navettes in mounts and pearls. The Swarovski navette stones can be placed in the mounts which have two pairs of holes in the base making them easy to use in wirework. 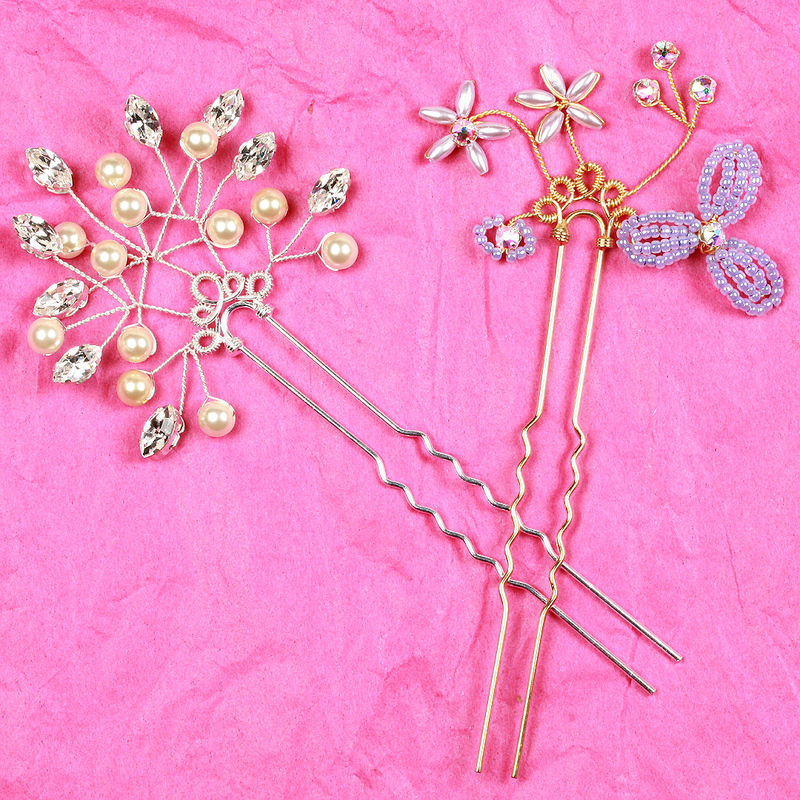 The second hair pin on the right in the design below uses oat-shaped pearls with Swarovski chaton montees with seed beads to create a spray of flowers. The Swarovski chaton montees also have two pairs of holes in the base so they can easily be wired into place. Small pieces of beadwork also make lovely decorative accessories. These hair clips have a “blank” or flat round disk at the top of the grip so that you can attach your decorative beadwork. 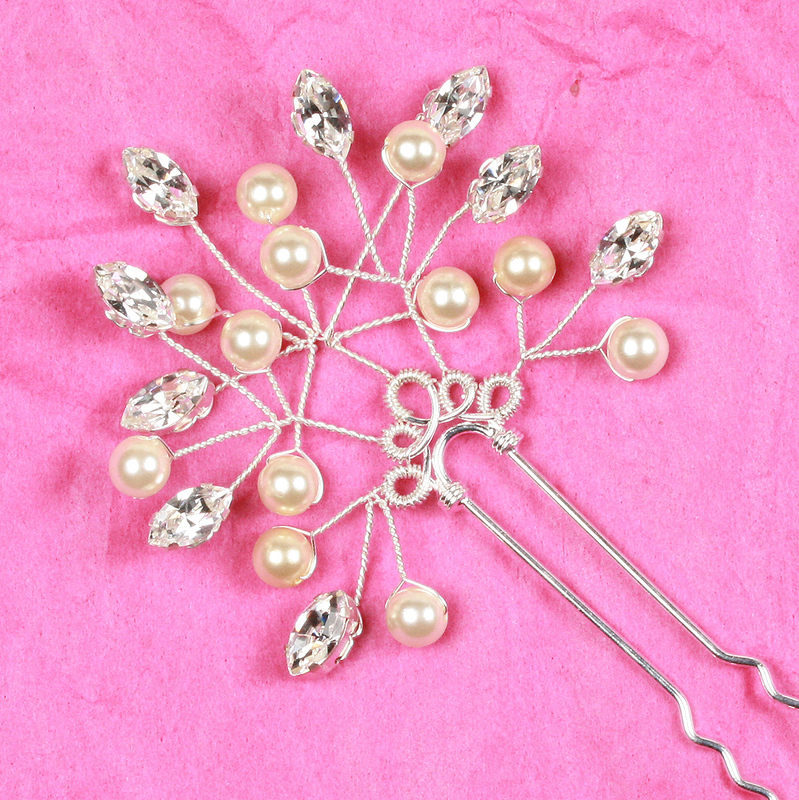 The flower design uses 2-hole diamonduo beads with superduos and Toho demi-rounds. The Toho demi-rounds are ideal for filling in small gaps between beads and creating a pretty edging. 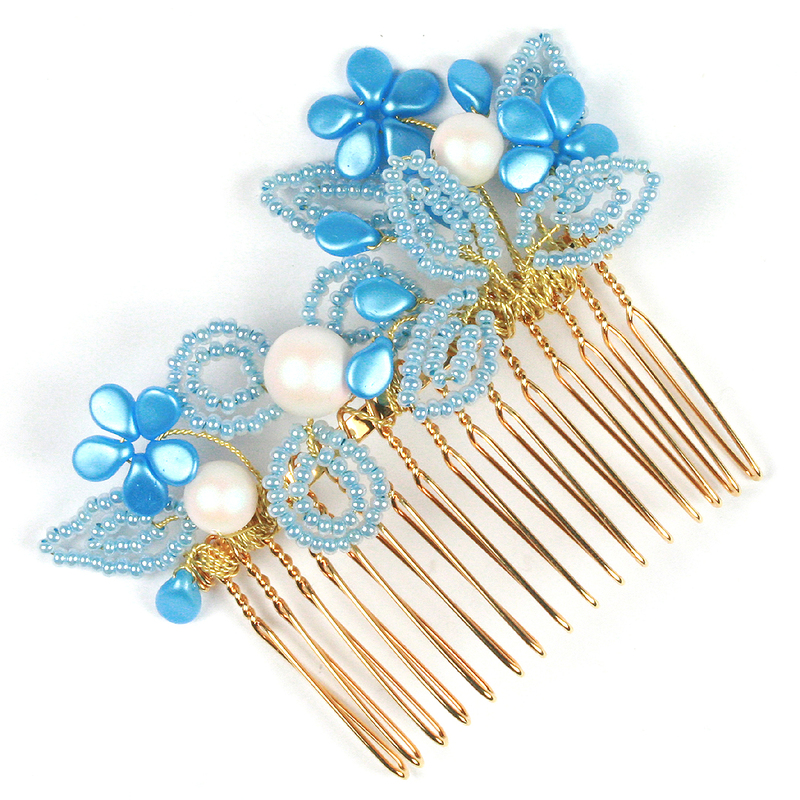 The second design uses miniduos and 2.5mm pearls to create little beaded round that can simply be glued to the metal disk on the hair clip.